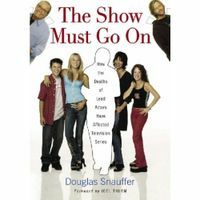 Don’t be fooled by the title of Douglas Snauffer’s new book, The Show Must Go On: How The Deaths of Lead Actors Have Affected Television Series…this is not a lurid or gossipy book but rather a serious, well-researched, detailed reference work about the business of television. On the surface, the book is about what happens to a TV show when one of its stars dies, covering the impact of the calamity from every angle. But that death is just one part of the story. Douglas Snauffer, author of the exceptional Crime Television, gives us the full picture of the show, before and after the tragedy that may (or may not) have ultimately defined that series in TV history. Each chapter offers an in-depth look at the creation, development, production, and history of an individual series. It’s that detailed examination of each series — backed by interviews with all the key players in front of, and behind — the camera that gives this book it’s real value. This book is a must-read for anyone who wants to know how TV series are created, written and produced…and why some succeed while others fail. NBC lost stars in Hill Street Blues, Night Court and Cheers in one season, then much later, lost stars in News Radio and Suddenly Susan. Not the best of luck for the “Peacock Network”. oh yes…I have another 48,000 words to crank out in the next 25 days or so on FATAL BEAUTY. Is this available on books on tape?